Hamburger, beefburger, you can even call it Susan if you want, but it really doesn’t matter! The Classic Burger is usually made with 100% beef, some breadcrumbs, an egg and seasoning and has to be our favourite grill ingredient along with the sausage! For the last decade or so I have lived in Germany and grilling is a bit different here. About 100 or so years ago I visited Germany to attend a motorcycle rally with some friends and hung out with an MC club for the weekend. It must have been a really long weekend because we seemed to do so much. We had a night in the club’s local bar. The next night we attended a local festival. The following day we went to the rally and on the final day we hung out at a park, and one of the coolest things I thought was that they had wooden shelters and grills set up in the park for people to party. What a cool idea! Now this BBQ that was held for us was in my mind the best I had ever been to. There was unlimited beer, which in the UK never happens apart from at my brother’s house. There were several bottles of JD passed around and the meat was to die for. Sausage or wurst as they call it here and marinated pork steaks in a marinade that I had never known before, superb! Anyway, having lived here for many years I know the taste too well as we see it at every German grill party. But they do have some great ideas here. They wrap thick strips of bacon in a spicy marinade around a skewer. You can buy these ready made. The pork steaks come in two marinades, one green and one red. Ready to grill chicken breasts in marinades such as Provence or Jamaica! All good stuff, except the bacon skewers tend to burn a bit and are about a 1000 calories a piece! So I have introduced things I like to grill. Homemade burgers, ribs, kebabs and the like and they are becoming…wait for it…”Legendary“! In England I had a great burger press from “Tupperware” which was a form that you pressed onto the meat and formed a nice pattie and it pushed the patties out, which was cool. I have a press that makes 200g size patties but you have to oil it first and then ease the patty out with a knife. But it works and makes a great Classic Burger! After you have put the meat and breadcrumbs in the bowl season to your own taste. You can add caramalized onions if you wish or raw. Make this recipe your own! Basically all you have to do is mix all the ingredients together in a large bowl then when well mixed take about a handful of the meat mix and press into the patty form. Press down with the press and remove any excess meat that squeezes out from around the edge. Remove the patty from the form and place onto baking paper. By putting paper between each patty they come apart without sticking. Wrap in cling wrap and leave in the fridge to chill. About half an hour before you grill take the burgers out and let them warm a bit. If you are grilling over coals, wait until the coals are white hot, then they are ready. Place the burgers on the grill and let each side grill well otherwise if you turn them over too early thete is a chance that they fall apart. If grilling in a pan, don’t put too much oil in the pan, better still use a griddle pan and just brush a bit of oil over it then when really hot put the burgers in. 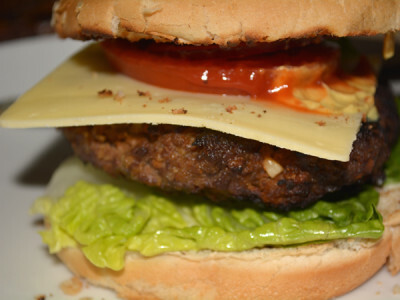 If you like a cheese burger use a nice slice of cheddar or a slice of gorgonzola for that extra flavour. I often place the slice of cheese on top of the burger before removing from the grill to melt it a bit.